Here are shortlisted entries to the competition, which showcases the best in environmental photography and film. The best photographs will be showcased at the Royal Geographical Society in London from 23 June to 4 July, and tour UK until November. The winners - chosen from more than 10,000 entries - will be announced on 24 June. 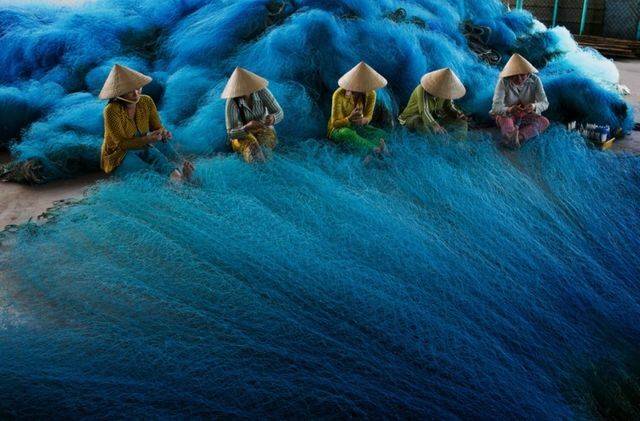 Below is my favourite, entitled 'Fishing net making in Mekong Delta, 2012', shot by a Vietnamese photographer Tuyet Trinh Do. I love the composition and vibrancy of the shot. A group of women weave a fishing net in the Mekong Delta, Vietnam, in preparation for the annual flooding of the river and its tributaries. Fishing communities rely on this flooding to bring an influx of fish and shrimp to the region. With climate change worsening, flood levels are becoming more inconsistent, which has important consequences for the livelihood of locals. In 2012, lower than average flood levels saw fish yields decrease by 40% compared to previous year.